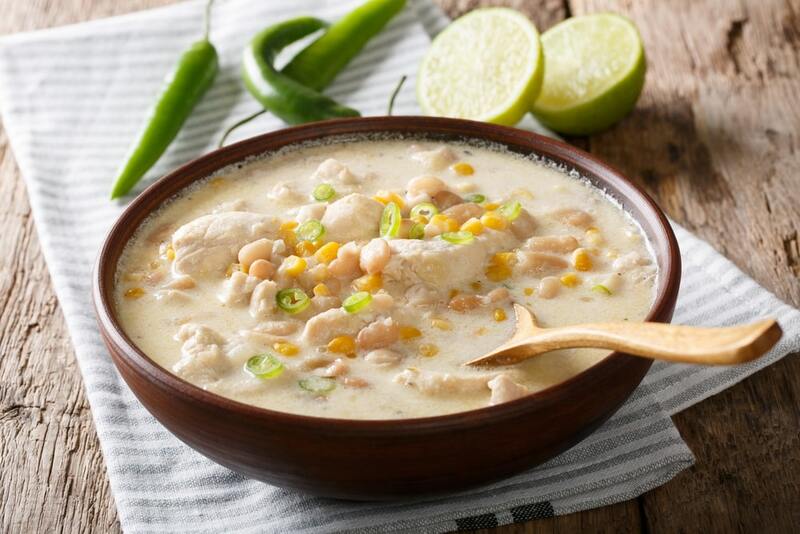 White Chicken Chili: It’s one of the best meal that you can prepare at home pretty quick and perfect for your busy weeknights. 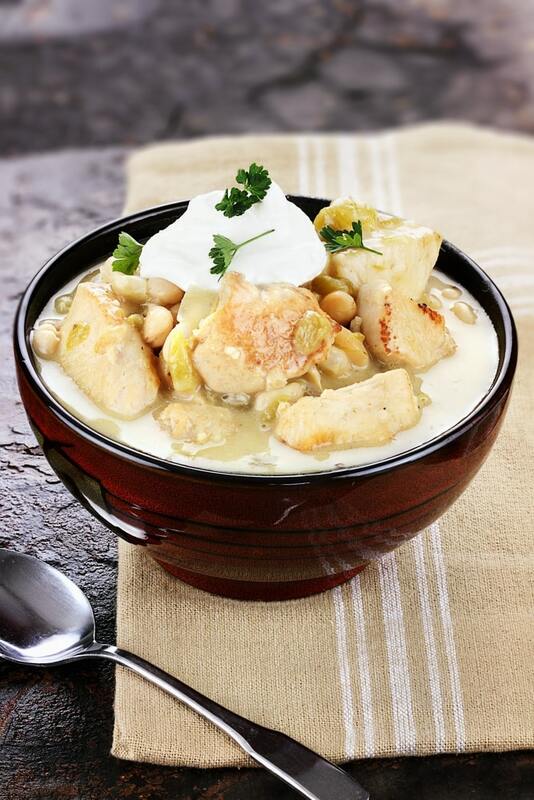 This White Chicken Chili can be served as an appetizer with tortilla chips or over baked potatoes. 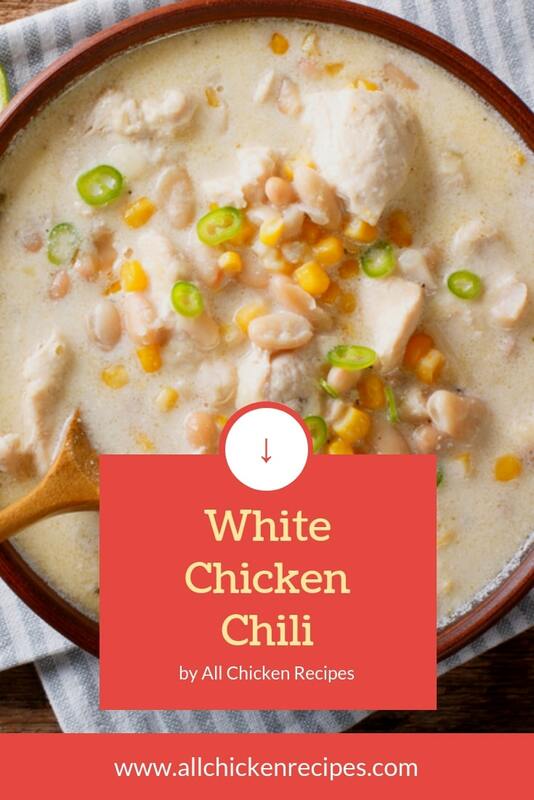 White Chicken Chili is very easy to make. 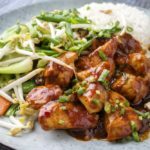 Personally, I like to make this recipe on a stovetop but I can understand that sometimes we don’t have that extra time to prepare the recipe, and so comes the slow cooker that makes it easier, just throw all the ingredients in it and it will be ready ahead of time. 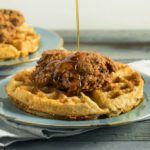 But this recipe also works beautifully for the stovetop. Below I have included both the variants of White Chicken Chili so that you can choose accordingly. White bean chicken chili is one of my favorite chili recipes and the flavors in it are so delicious and completely out of this world. It has everything in it to make it more delicious like onion, garlic, green chilies, and cumin. These few ingredients are completely a game changer. 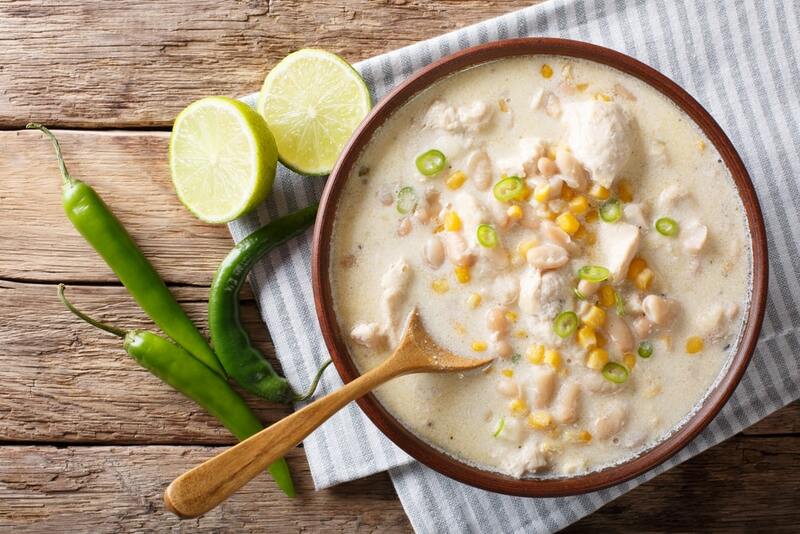 White chicken chili is usually made with heavy cream to make it creamy and smooth but to keep it simpler, healthier and lower in calories you can use reduced fat cream cheese and the shredded cheese on top and finally you can have it with some slices of healthy avocado, baked potatoes, a few jalapeno slices, and some tortilla chips. Heat olive oil in a large pot over medium heat. Add garlic and onion and saute for 3-5 minutes. Add beans, broth, chicken, green chilies, and seasonings. Bring to a boil and simmer 30 minutes on low heat. Serve with your choice of toppings, like tortilla chips, shredded cheese, onions, cilantro, and sour cream. 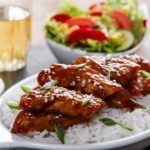 Add chicken breasts to your slow cooker, top with pepper, cumin, salt, chili powder, oregano, and cayenne pepper at the end. Top with minced garlic, diced onion, white kidney beans, green chiles, chicken broth, and cilantro. 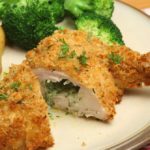 Remove the chicken from your slow cooker then shred the chicken and put it back to slow cooker. Add cream cheese, stir and cook until chili is slightly thickened and creamy for 15 minutes on high. Stir well and serve with your favorite toppings. Make sure to use an airtight container. Firstly, prepare the recipe and let it cool before you place them on the container and then after it is completely cool put them on your refrigerator or freezer. 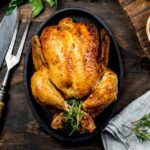 Now the most important part, if you are planning to serve it tomorrow then remove from freezer and place in the refrigerator and let it defrost overnight before planning to serve. And if you want to use a slow cooker then you can cook it on low throughout the day so that chili gets warm or you can also use a microwave or a large stockpot for reheating process. 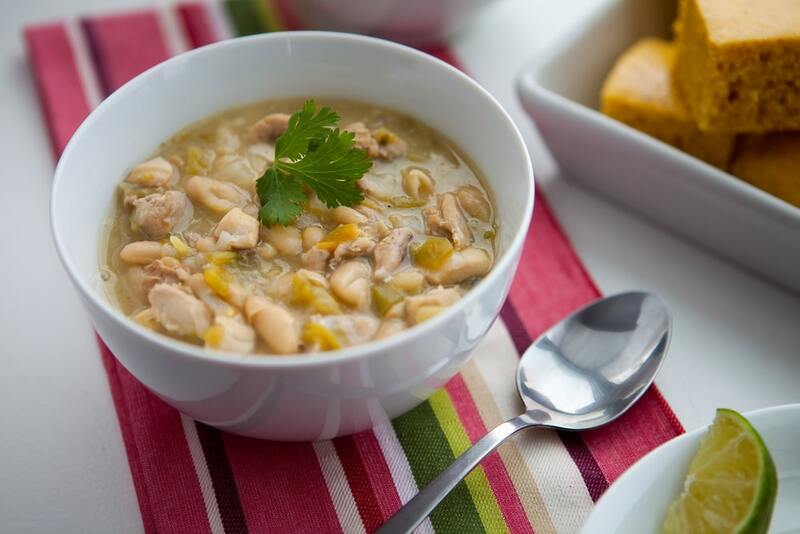 You can serve your delicious white bean chicken chili with a variety of toppings, like some sliced avocado, shredded cheese, a few jalapeno slices, baked potatoes, some tortilla chips, cilantro, and onions. You can use plain greek yogurt if you want to avoid sour cream. And if you want to make White Chicken Chili spicier then make sure to add the jalapeno slices that I have mentioned above. 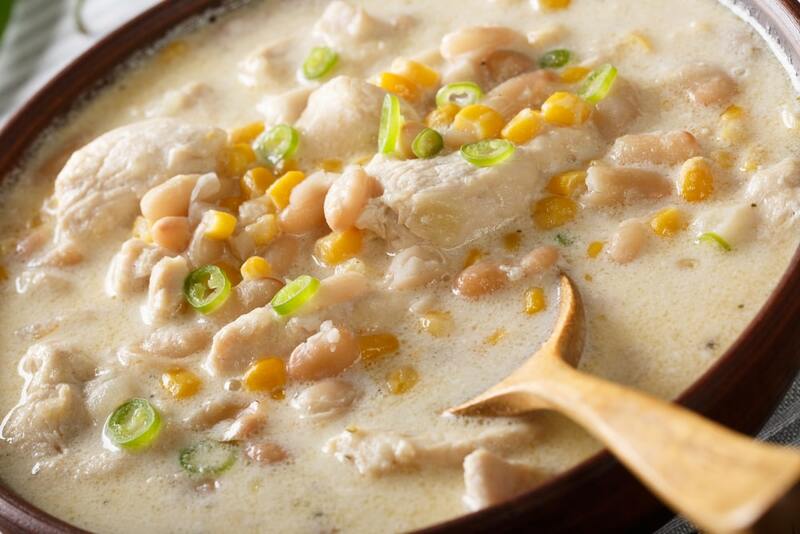 White chicken chili is usually made with heavy cream to make it creamy and smooth. 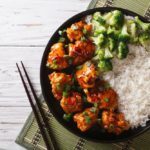 The meal that you can prepare at home and perfect for busy weeknights. In a large pot heat olive oil over medium heat. Saute the chicken, onion, and garlic for 3 to 5 minutes until the chicken is browned completely. Cut the chicken into 1-inch pieces and then add white kidney beans, chicken broth, oregano, cumin, green chilies, and cayenne pepper. Bring it to a boil and simmer for 30 to 45 minutes until the chicken is cooked through. Season with salt and serve with your favorite toppings like shredded cheese, onions, cilantro, and sour cream.